Tea Journals Always Bring a Smile! 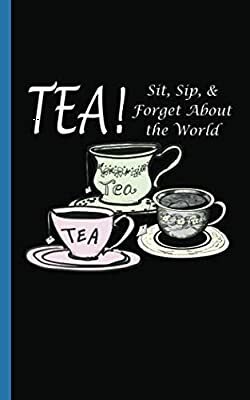 Softcover notebook, professionally designed lined lightweight journal makes a unique, gift idea for a any black, green, or red tea drinker. Sit Sip and Forget About the World - Tea Lover gift idea for Tea Drinker basket gift. Motivational! Inspirational! - designed for backpacks, vacation trip traveling, gym bags, travel team athletes, bedside table, or Christmas stocking stuffer. Binding:Durable trade paperback binding (perfect bound) with college ruled paper works well for kids summer camp or one subject school assignment, taking notes, journaling, or a Do-It-Yourself (DIY) diary for men or women. Bound similar to books found in your local library. Use as a writer's journal, office exchange party gift, or for the desk of any academic University or High School student. Works best for black, red, or green tea drinker (hot or cold) - especially women (mom, grandma, aunt, sister, daughter). Makes a fun, great everyday notebook or back-to-school appreciation gift for a popular teacher who loves tea anytime of the year. Perfect to record your travel memories, training thought quotes, lesson reminders, or success stories. Add your own note on the inside cover to make this a personalized gift for a boyfriend or girlfriend.